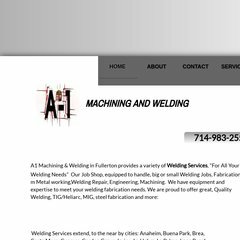 Topics: Metal Fabrication, Welding Services, Mig & Tig Welding, Carbon Steel Welding, Stainless Steel Welding, and Aluminum Welding. It is hosted by Godaddy.com Inc (Arizona, Scottsdale,) using Apache web server. ns34.domaincontrol.com, and ns33.domaincontrol.com are its DNS Nameservers. Its IP Number is 184.168.192.65. PING (184.168.192.65) 56(84) bytes of data.